Both procurement and accounts payable are two of the most critical functions of any business. They also encompass some of the most complex and critical business tasks that every company, no matter how small or large, must contend with. Unfortunately, this means that they are often the Achilles’ heel of many operations. An Oracle study demonstrated that procurement operations are the number-one source of loss from fraud and waste. While Levvel Research has compiled an extensive list of both manual procurement and accounts payable challenges that, when combined, present a strong business case for implementing procure-to-pay software. 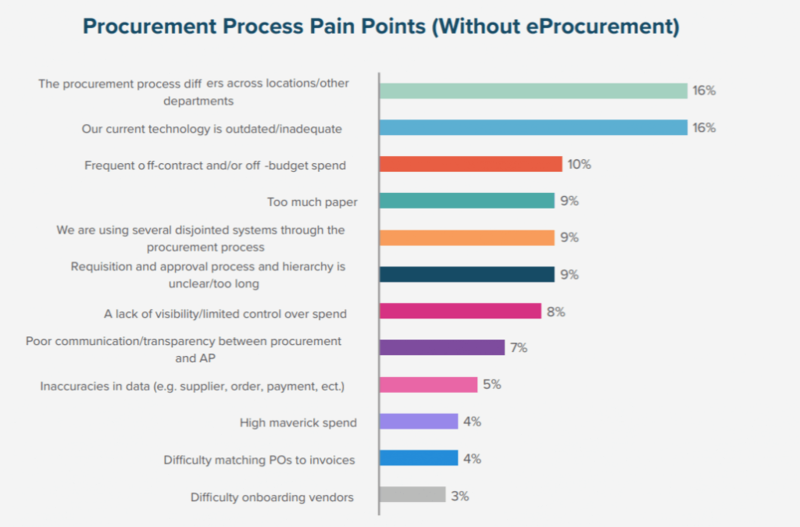 According to Levvel’s procurement report, fragmented processes, outdated technology, and off-contract spend are amongst the top issues for organizations operating manually. 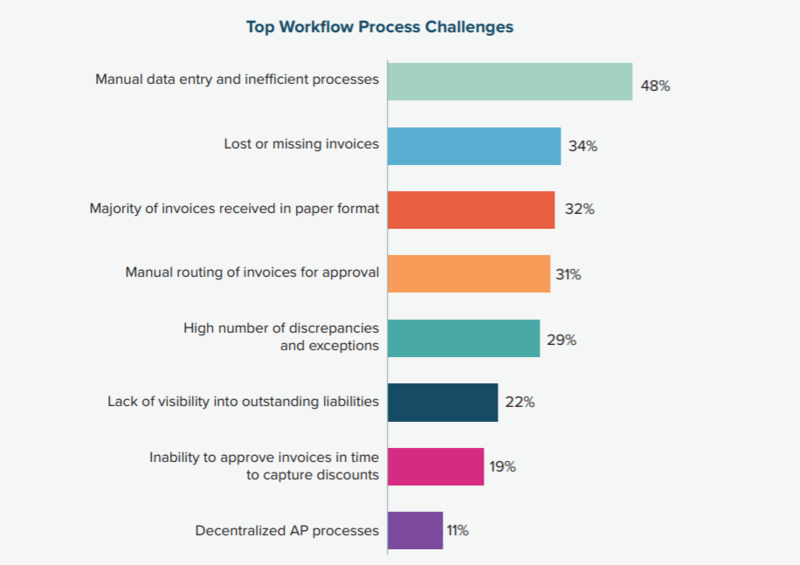 The accounts payable report lists manual data entry, manual routing of invoices for approval, lost/missing invoices and large amounts of paper as the biggest manual pain points. All told, the procure-to-pay process is a highly complex one even in the smallest enterprises. And it is often fraught with extreme difficulties, requiring a carefully designed program that does far more than patching together a series of domain-specific, siloed solutions into one Frankenstein-like entity. The procure-to-pay process needs to take a holistic approach while being tailored to the often highly unique needs of the individual business in question, taking into account not just physical, accounting and data elements but the human participants in the system as well. The obvious solution to procure-to-pay inefficiencies for many businesses has been the implementation of a procure-to-pay software solution. However, just having a generalized software solution, no matter how well proven or powerful, is oftentimes nowhere near enough. Understanding not just how the implementation of procure-to-pay software can succeed but why they fail can go a long way towards avoiding some of the most common pitfalls that companies often encounter. Let’s take a look at five reasons why procure-to-pay software can ultimately fail to deliver the promised efficiency gains for so many companies. Diagnosing procure-to-pay problems at the highest level may seem deceptively simple. It may be true that your business is facing issues with maverick spending, too much paperwork, a pervasive lack of purchasing controls, poor verification by accounts payable or just flat-out leaking too much money through the procure-to-pay process in general. But going deeper and figuring out why these things are happening can prove to be far more difficult than many managers are prepared to deal with. In some cases, simply buying the right tool for the job may mostly clear up a problem. One example would be getting a solid automated invoicing system to avoid the ever-present opportunity for error and unnecessary time consumption inherent in filling out invoices by hand. However, more often, there are complex dynamics at work, like non-uniformity of data between departments mixed with multiple different processes having evolved within those departments. The bottom line is that running careful root cause analyses and making sure that the problem is thoroughly understood is the only way to ensure that the problem can be solved through software. Even the best software cannot solve a problem for which it was not designed. It’s another application of the old saying: garbage in, garbage out. Defining the problem in the unique context of your business is the indispensable first step towards a viable procure-to-pay software implementation. A full-scale implementation of procure-to-pay software is expensive and, above all, time-consuming. Before going down the road of a full, end-to-end, implementation, which can take as much as an entire year for all stakeholders to be brought up to speed, it is worth making absolutely certain that you are going with the right tool. Does your organization definitely need to fully automate its entire procure-to-pay process? Or do you simply need to increase visibility over spending patterns or alternatively improve efficiencies within invoice processing, for example? One of the most prominent reasons for a procure-to-pay software implementation ultimately failing is that compliance with the new software and procurement and accounts payable regimes is simply not adopted by employees and other stakeholders. Although it represents a major undertaking, correctly identifying the problem with an organization’s procure-to-pay process and tailoring a viable solution is not enough. Stakeholders must understand why the changes were necessary and how the changes will help them to perform their jobs. Finally, they must be brought up to a level of at least minimal technical competence within the new environment. This is often easier said than done, though. According to Deloitte’s Global Chief Procurement Officer Survey 2018, 51% of procurement leaders do not believe that they have the capability in their teams to deliver their procurement strategy. Additionally, the report found that 72% of procurement leaders are spending less than 2% of their budgets on training and development budgets for their team. This attitude needs to change in order to experience true success with a procure-to-pay software implementation. Some experts recommend sparing no expense on education and training throughout the implementation process. Specific steps that an organization can take to ensure compliance and comfort with a new procure-to-pay system include branded training videos for both employees and vendors. It is also a good idea to target requisitioners and buyers who have been identified as particularly non-compliant as these tend to follow ‘Pareto distributions’, with roughly 20 percent of the employees being responsible for roughly 80 percent of non-compliant spending. 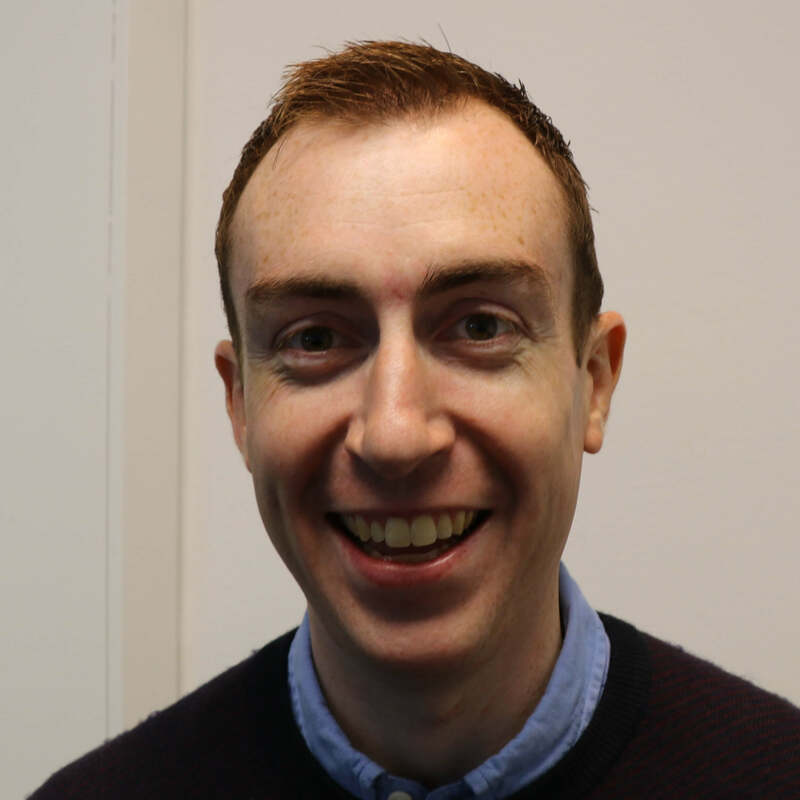 One of the more serious problems that often occur in the implementation of procure-to-pay systems is that not all stakeholders are given a chance to voice their input or even to be kept abreast of changes being made. Because procure-to-pay systems can potentially affect literally every aspect of a company’s operations, making radical changes to the system can often have a deep impact on the operations of many departments. Attempting to shoehorn technology into departments that already have entrenched processes is more likely to cause a sidestepping of the system rather than compliance. And without all stakeholders being on the same page strategically, through lack of communication, training or effective software, the implementation is all but doomed to failure. Our blog on the Three Pillars of Procurement Transformation outlines how people, processes and technology (and in that order) should be factored into any procure-to-pay software implementation. In order to keep everyone on the same heading when it comes to new procure-to-pay software, it is vitally important to accurately communicate why the changes being made are necessary. In a recent blog, we discussed why educating employees is key to getting them to embrace change. Due to the complexity of many procure-to-pay systems, you may end up asking your employees to endure months of a learning curve. Because compliance is paramount, making sure they understand both the reasons behind the change and how to expertly use the new software may be the most important step you can take. The implementation of an end-to-end, procure-to-pay software system can be a complex and time-consuming undertaking. Before any implementation begins, it is vital that you are sure of your problem, what kind of software you require to solve your problem and have educated and communicated with all affected stakeholders. Once you have covered these steps, your organization will be in a strong position to experience the benefits that a procure-to-pay software implementation can bring.